From a black tiled podium rise a pair of three-storey tiled volumes. The space between them is left open in the interior, except for a glass roof. l n front of all this stands a frosted glass screen with a single small opening punched in its centre leading to the office by way of a light trap. 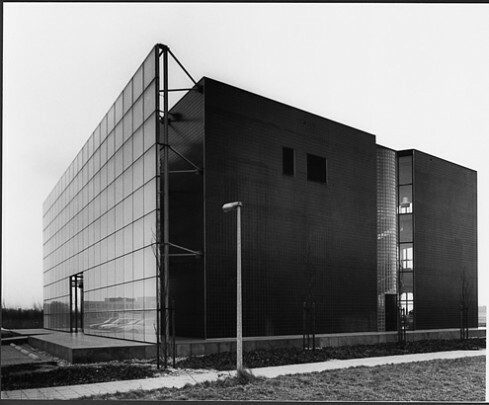 The rear of the building is all glass giving an ample view of the surrounding polder landscape from both the void and the work stations. The design's principal feature is the sequence of lighting experienced by visitors on their way through the building.